Smart phone market in India is growing rapidly.“India is the rising smartphone market of the world". 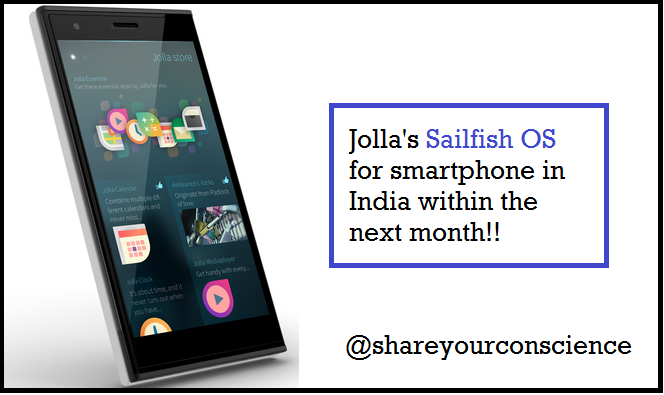 Jolla deals with Snapdeals to sell their smartphone with Sailfish OS in India from next month. 1.4GHz Qualcomm Snapdragon dual-core processor . 16GB storage expandable via microSD card. 8MP rear camera alongside an LED flash. 2MP front-facing camera as well. One of the USPs of the phone is changeable 'The Other Half' smart covers that also change the phone's user interface theme. It runs Sailfish OS, which is based on MeeGo, the same OS that was last seen on Nokia's N9 smartphone. In fact, Jolla was founded by a group of ex-Nokia employees who were involved with the development of MeeGo based devices at the company. Lets see what happened.